Are any of you as sick of this weather as I am? I mean, January felt like it was decades long and February isn’t much better. It’s been pretty sunny and the temps haven’t dropped to ridiculous lows but it’s still a looong way away from spring…even though Mr. Groundhog doesn’t think so! These winter blues also bring along procrastination – at least for me it does. And, with procrastination comes all sorts of trouble…and not planning your meals tends to be a big one. We tend to fly by the seat of our pants and then, inevitably, make bad decisions when it comes to food. So, let me help you out here. Take a peak at how easy it is to plan for at least one of your meals…breakfast! If you can whip up some of these tasty sausage patties (so much better than those store bought ones – ’cause who really knows what’s in those babies? ), half of the effort is taken care of. 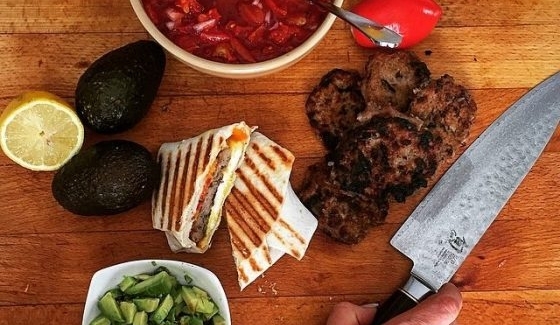 …you can go ahead and use them to build your own breakfast buritto! Then get creative…some grated cheese perhaps? Then some salsa for some extra spice! Then, just like swaddling a baby (not really, but you get me, right? ), wrap it up. Now, who wouldn’t get happy seeing that on their plate? I know I would. They also make a great breakfast for you kids in university. Boy are they gonna love you now!! Add the onions and cook, stirring often to ensure they don't burn, and cook for about 5 minutes or until they are soft; add the onions to a large bowl and set the pan aside. To the same bowl, add the ground meat and the seasoning (salt, pepper, oregano, sage); mix to combine and form into small patties (I won't give you sizes as you can make them as big or small as you like - mine are usually 2 tbsp per patty). In the same pan you cooked the onions, add the patties and brown on each side (the time you cook will depend on how thick you make them); once they are cooked through, place them on a plate. In the same pan, cook your eggs according to each person's taste (I like to scramble 2 per burrito - if you are making a few at one time, I suggest you scramble 8-10 eggs, seasoned with salt an pepper and divide them among each tortill). To assemble your burrito, place a portion of cooked egg on top of the tortilla; next place a sausage patty on top, then top with cheese and then salsa; then tuck in the ends and roll up tightly. If you are cooking them right away, heat up your sandwich press (or you can use a heavy pan like a cast iron pan); place the rolled burrito in the sandwich press and close for a few minutes (if you are using a pan, place a lid on top of the burrito and place something heavy on top of it to weight it down while it cooks).. When the burrito is ready (you should see browning and hear some sizzle from the cheese), enjoy it while it's warm. You can also wrap them up in plastic wrap (before cooking) and place all the pre-cooked and wrapped burritos in a large freezer bag and store in the freezer until you are ready to use them. Once you are ready to serve them, microwave them for one minutes and then continue the cooking process as stated above in either a sandwich press or heavy bottom pan. Serve with more salsa or some cut up avocado.